LAREDO — Many Texans who live along the border with Mexico share the legend of La Llorona, a repentant mother who is said to have drowned her children in the Rio Grande. And they pass on another myth: Once you drink the river-fed tap water here, you are bound to the region. Such tall tales are an ode to the 1,900-mile river that is known as the Rio Bravo to Mexicans, whose connections and ownership of the river is as strong as their neighbors to the north. Researchers say the Rio Grande is one of the most studied and controversial bodies of water in North America. But with various levels of government in two countries making decisions that influence it, the Rio Grande has become the subject of interstate and international legal battles that have intensified during the continuing drought. The river begins about 12,000 feet above sea level in Colorado and flows southeast, cutting through New Mexico and forming the Texas and Mexico border between Chihuahua State and El Paso. In El Paso, the river flows through a concrete channel where the banks on either side of the international bridges contain more graffiti than brush. In South Texas and the Rio Grande Valley, it swells deep and wide enough that each year several people trying to cross it drown. Local residents argue that artificial barriers are not needed because of this natural boundary. It is at the New Mexico border where water needs and individual interpretations of laws create one controversy. New Mexico and Texas are embroiled in a lawsuit over groundwater extraction. Texas argues its neighbor is allowing excessive pumping, reducing the flow of the Rio Grande into Texas. A 1938 compact between Colorado, New Mexico and Texas governs how much of the river’s water the states are allotted. Eckstein says that the compact does not consider different state practices. As the Rio Grande continues southeast, intrastate needs create more domestic discord. Tom Miller, the director of the Lamar Bruni Vergara Environmental Science Center in Laredo, said people there are monitoring a proposal by the city of San Antonio that would pipe in water from the San Felipe Springs in Val Verde County. The springs feed the river, and Miller said the action would harm one of the few hundred springs left in a state that used to contain thousands. “We’re very concerned about this intrabasin transfer of water,” said Miller, whose Webb County office is just feet from the Rio Grande’s banks. “How will it affect the general water table of the river, and will it lower so that the water will have a harder time being delivered to the intended recipients? How will it affect ours?” San Antonio officials say considering the option is necessary to help satisfy its growth needs, which have been magnified by the drought. About 60 miles downstream from Del Rio in Eagle Pass, a battle over a coal mine and its potential impact on the river is a source of contention between the U.S. and Mexico. For years, local officials and environmentalists have sought to halt the expansion of a Mexican-owned coal mining operation into Texas, alleging it will pollute the river, the city’s main source of water. The company, Dos Republicas, has an affiliate in Mexico that is already mining low-grade coal and dumping a portion of its waste in to the river, local residents said. A spokeswoman for the company says all regulations are being met, and the company has received its required permit from the Texas Railroad Commission. A coalition of coal mine opponents, including Maverick County, the city of Eagle Pass, the Maverick County Hospital District and the Maverick County Environmental Association, has filed suit in state district court to have the decision repealed. A hearing is scheduled for February, said George Baxter, the president of the environmental association. Miller and others in Laredo are also monitoring to see whether the U.S. Border Patrol restarts a project that seeks to rid the U.S. side of the Rio Grande of an invasive species called the Carrizo Cane. The tall, non-native plants siphon water from the river, but the Border Patrol’s interest in removing the brush is to prevent smugglers and would-be illegal crossers from evading detection. The pilot program, which began in March 2009 and was confined to 25 square acres spanning 1.1 miles in Laredo was suspended just months after it began amid environmental concerns over the aerial spraying of an herbicide. The Border Patrol added that it needed time to clear up the “misinformation” about the project. The public affairs office at the Border Patrol’s Laredo Sector did not respond to a request seeking updated information about the eradication efforts. The clearest example of how international politics affects the Rio Grande is a 1944 water treaty between the U.S. and Mexico. The treaty states that Mexico must provide the U.S. surface water from Mexican tributaries that feed into the river. In turn, the U.S. is to deliver water from the Colorado River. Mexico is supposed to provide 1.75 million acre-feet of water every five years. American officials contend that Mexico should supply 350,000 acre-feet annually, unless prevented by extreme environmental circumstances. Others say Mexico can make good on its delivery at any point during the cycle. 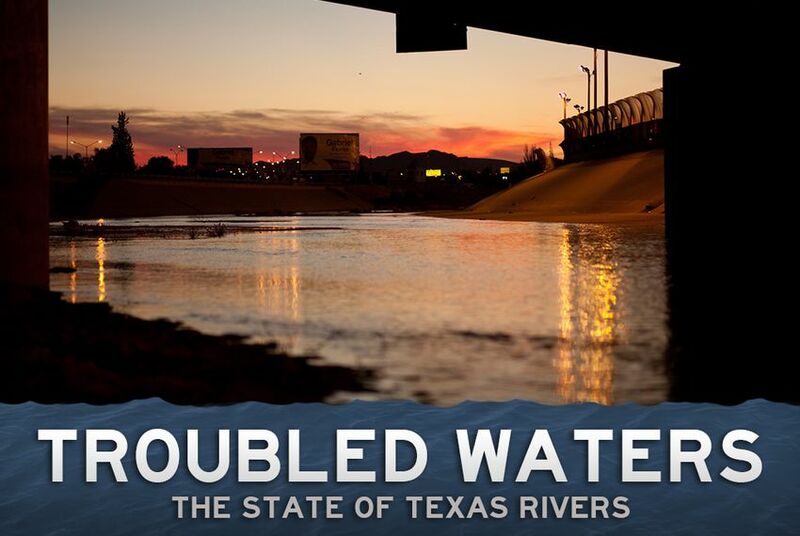 Sally Spener, a foreign affairs specialist with the El Paso-based International Boundary and Water Commission, said that as of Nov. 23, the supply deficit was 275,000 acre-feet, down from 484,000 in June. The deficit prompted Sens. John Cornyn and Ted Cruz, R-Texas, to file legislation urging Mexico to comply and Gov. Rick Perry to write the Obama administration with a similar demand. But Mexico has not technically violated the treaty. And in certain areas along the Rio Grande, its tributaries are the main supplier of water. Mexico also cites the drought as one reason it continues to hold on to its supply. At Falcon Lake, a massive reservoir that straddles Mexico at Tamaulipas State and Webb and Zapata counties in Texas, more than 80 percent of the water that is distributed comes from Mexico, Miller said. Spener hopes future discussions with Mexican officials can resolve the divisive issue. “One of the things we are really pushing for is to have Mexico, when it works on its water plans for its irrigation districts for the coming year, set aside a specific volume for treaty compliance,” she said. It is now the fourth year of a five-year cycle. Eckstein said that bureaucratic hurdles also affect what stakeholders know about the river and how it is fed. Transnational aquifers, he said, are a mystery because data is not shared across the border. Knowing how many aquifers span the border would inform public use practices and legislation, he said, citing the basics of the hydrological model. “Groundwater is connected to surface water is connected to groundwater is connected to surface water. It’s that simple,” he said. But the closest researchers have come is to claim that anywhere from eight to 20 aquifers lie below the river’s surface. Aquifers south of the border do not show up on American researchers’ maps, Eckstein said, and the same happens north of the border for the Mexican researchers. “It’s that stupid. We’re not, at least not officially, sharing data on a federal government to federal government level,” he said. Despite the current challenges, the river will rebound, if history is an accurate indicator. Miller said that in 1993, the Rio Grande was declared endangered by the American Heritage Rivers Initiative, which addressed the environmental and historical concerns of American rivers. The problem then was pollution and not water levels. The problem is nowhere near contained, but inroads have been made. An international wastewater treatment plant funded by both nations was completed in 2000 and has helped alleviate the problem, though infrastructure problems in Nuevo Laredo continue to cause raw sewage to flow into the river. The river was also declared endangered in 2001, when it dried up in some spots. Again, it has rebounded, but Miller said conservation efforts must become a priority if the river is going to sustain the estimated population explosion on the border in the coming decades. The population on the Texas border is expected to double in about 20 years.